In this article, we’ll discuss IdentityHashMap from the java.util package. Note that this implementation is not synchronized. If multiple threads access an identity hash map concurrently, and at least one of the threads modifies the map structurally, it must be synchronized externally. IdentityHashMap() - Constructs a new, empty identity hash map with a default expected maximum size (21). IdentityHashMap(int expectedMaxSize) - Constructs a new, empty map with the specified expected maximum size. IdentityHashMap(Map<? extends K,? extends V> m) - Constructs a new identity hash map containing the key-value mappings in the specified map. Object clone() - Returns a shallow copy of this identity hash map: the keys and values themselves are not cloned. boolean containsKey(Object key) - Tests whether the specified object reference is a key in this identity hash map. boolean containsValue(Object value) - Tests whether the specified object reference is a value in this identity hash map. boolean equals(Object o) - Compares the specified object with this map for equality. int hashCode() - Returns the hash code value for this map. 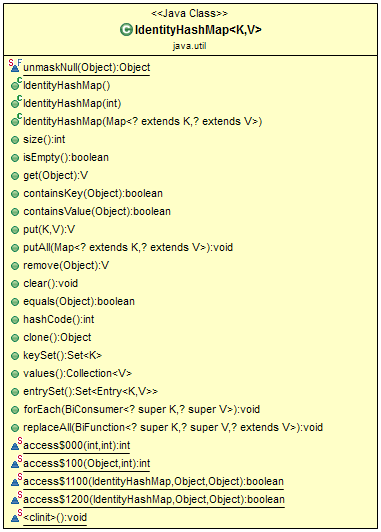 boolean isEmpty() - Returns true if this identity hash map contains no key-value mappings. 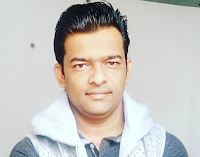 Set keySet() - Returns an identity-based set view of the keys contained in this map. V put(K key, V value) - Associates the specified value with the specified key in this identity hash map. V remove(Object key) - Removes the mapping for this key from this map if present. int size() - Returns the number of key-value mappings in this identity hash map.